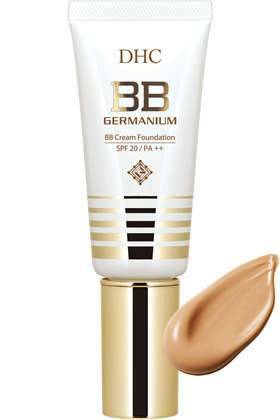 "DHC BB Cream GE" is a multifunctional type cream combining the advantages of moisturizer, foundation, concealer and UV sun-block all in one tube! This is an ideal solution if you want to give your skin a beautiful make-up but do not have much time. Starting with water-soluble germanium with amazing anti-aging effects, "DHC BB Cream GE" is for 98% made of beauty essence components and minerals. Rich moisturizing and resilience effect. For all those who have spotted such aging signs as wrinkles and flabbiness of their skin, this product adds liquid organic germanium that will gently care about your skin while you are doing your make-up. Even more, such important beauty essence components as marine collagen, elastine, super hyaluronic acid (contains both low-molecular-weigh and high-molecular-weight hyaluronic acid) will apply the precious moisture to every corner of your skin and restore its resilience. Cover for fine wrinkles. This product adds the special component "Lift-up Film EX" that will help cover the shallow (fine) wrinkles. The three lift-up components are quickly absorbed by your skin that will efficiently cover shallow wrinkles under the eyes, where skin is very thin and it will make your skin look young and attractive. Skin stains and freckles. This product adds "bright-up powder" that will cover stains, freckles and other unevenly colored skin spots and make you color look naturally light and one tone. This product also adds "lasting white pigment" that mixes well with skin sebum and sweat and give your skin a lasting luster effect. Mineral make-up. Being especially gentle to skin, this cosmetic adds 6 types of mineral components, each of them without applying any stress, perform such important effects as covering stains, uneven or dull spots and creating the natural-looking luster effect. Cover for the skin pores and uneven spots. Adding «smooth fit powder» this cosmetic fills all the rough and uneven spots on the skin and makes the skin surface perfectly even. Sun-block effect. When our skin is exposed to sun-rays melatonin gets produced which becomes the reason for skin stains and freckles. While this cosmetic contains no ultraviolet absorbers that put extra stress on our skin, mineral components in "DHC BB Cream GE" will help significantly reduce UV radiation in a natural way.